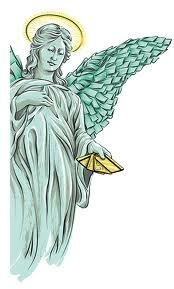 An Angel of Debt (Angelus debiti) is a monster that was created by the Gods to be defender of the proletariat, protector of the pocketbooks of the poor. Selfishness and avarice are their enemies. Angels of Debt have descended upon the residents of Godville as a result of bankers' usury and heroes' wide-eyed ignorance of financial reality. With trillions of gold pieces "mysteriously" going missing from the economy, a permanent rift has opened between the Divine Monetary Plane, and through it, the angels come to attempt to rectify the situation by removing the chief cause of debt: human greed.